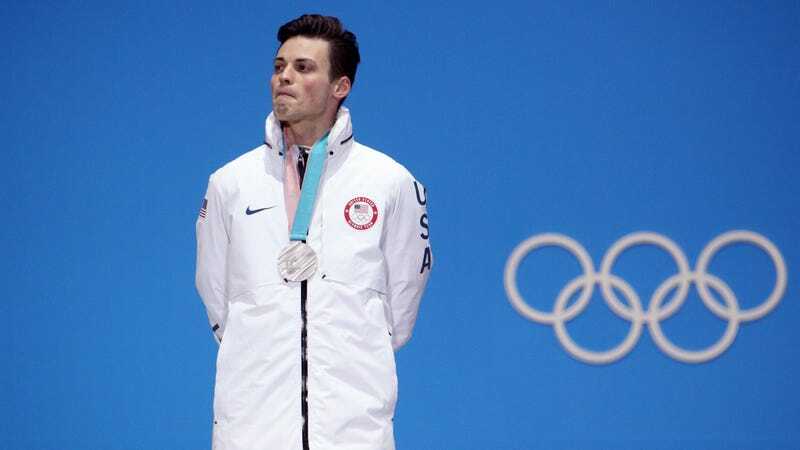 U.S. Olympic speedskater John-Henry Krueger announced on Monday that he is joining his brother on the Hungarian Olympic team, ending a lengthy spat between U.S. Skating and the Krueger brothers. John-Henry’s departure was first confirmed by USA Today. In an emailed statement to the outlet, Krueger wrote that while he’s proud to have represented the U.S., he has no choice but to leave the team. “If I continue pursuing my career with the US team, I will bankrupt myself and my family,” he wrote. “I was and am still proud to have represented the United States during my career but have been faced with an unsustainable situation where if I continue pursuing my career with the US team I will bankrupt myself and my family,” Krueger told USA TODAY Sports via email. U.S. Skating chief executive Ted Morris did just that, telling USA Today, “we are not going to force anyone to wear the Stars and Stripes who doesn’t want to.” He also said no skaters get four years of guaranteed funding, like Krueger was requesting. The news of Krueger’s decision shouldn’t come as a shock, as John-Henry and his brother Cole have both been fairly public with their critiques of the U.S. federation over the past seven years. A year ago, the Wall Street Journal detailed the Krueger brothers’ fraught relationship with U.S. Skating. The majority of the issues the two have with the federation stem from their complaints that the U.S. program does not adequately fund U.S. skaters, forcing them to pay out of pocket to remain among the world’s elite athletes and then pulling funding when the skaters don’t comply with their sponsorship duties. There’s a list of minor run-ins that led to both brothers departing from the program. In 2015, John-Henry refused to wear a heartbeat monitor, spurring U.S. Skating to threaten to withhold his monthly stipend. In February 2016, the brothers were threatened with fines by U.S. Skating after they took the podium with their U.S. warmup jackets turned inside-out. After that snafu, Cole decided to skate for Hungary, while John-Henry stayed on with U.S. Skating, though he began distancing himself from the program. John-Henry trained in South Korea and the Netherlands in the lead-up to the 2018 Winter Olympics—he had long been training there with Jae Su Chun, a speedskating coaching legend with a trail of coaching abuse allegations that the Kreugers have worked with since 2011. For this past Olympics, he trained with Jimmy Jang, an assistant for Chun. According to the Journal, Cole’s been helped significantly as it relates to finances since his move to Hungary, because the Hungarian program “covers his ice time, coaching, travel, equipment, training, and blade work and provides a subsidized apartment,” leaving him to pay for utilities and food. Krueger is only 23 years old and is fresh off a silver medal; barring injury, he will almost certainly rack up medals at the next Winter Games four years from now. But when he takes the podium that time, he and his family won’t be drowning in debt, and he won’t be wearing the Stars and Stripes.